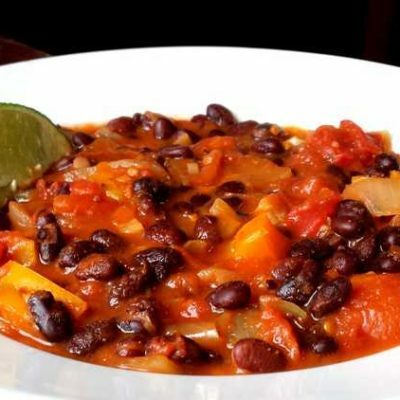 This Caribbean Black Bean Chili recipe is built on pantry staples and is ready in about thirty minutes. There is a good chance you have all the ingredients already. It is perfect for a cold winter day to fill your belly without requiring a lot of time cooking or prepping. 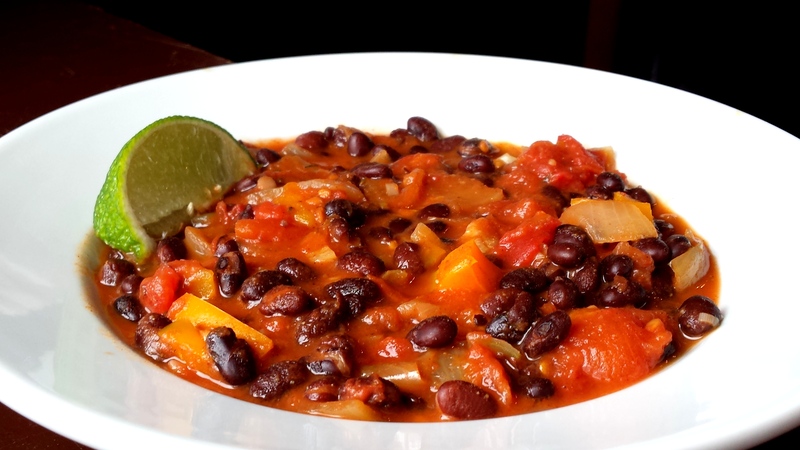 My husband isn’t a huge bean fan but he does like black bean soup so I decided to brave a black bean chili with the same flavors. I just had some for lunch and it was amazing so I’m going to hope he agrees. Or maybe I’ll hope he doesn’t so I can claim all the leftovers…. 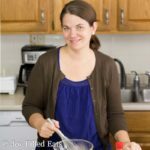 This is my first E recipe ever. When I started THM I was a veteran to low carb meals having been on a variety of low carb diets over the years. But Es were more of a challenge. When I did paleo/Whole30 I ate a good amount of carbs but I was used to drenching my sweet potatoes in coconut oil so eating carbs without fat was new. This is vegetarian, dairy free, gluten free, grain free, and a THM E.
Heat coconut oil in a large pot over medium heat. Add the chopped onion, pepper, and garlic. Cook until lightly browned and softened. 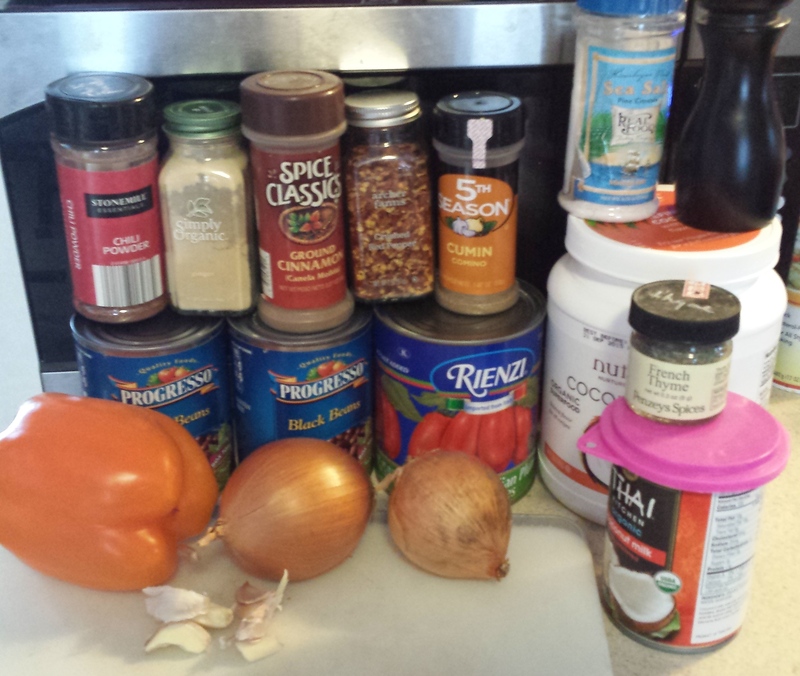 Add the beans, tomatoes and their juice, and all the seasonings. Simmer for at least twenty min so the flavors can meld. Right before serving stir in the coconut milk. Serve with chopped cilantro and lime wedges. Heat coconut oil in a large pot over medium heat. Add the chopped onion, pepper, and garlic. Cook until lightly browned and softened. Add the beans, tomatoes and their juice, and all the seasonings. Simmer for at least twenty min so the flavors can meld. Right before serving stir in the coconut milk. Serve with chopped cilantro and lime wedges. how many servings is this? can I add quinoa or rice? or will that put my over on carbs for THM E? 4 big servings. You could have a smaller serving and still have rice or quinoa. I added a nutrition box so you can see the carbs. Thank you so much! I love all your recipies. You are my go to blog right now!